Provided you haven’t been toiling away in a secret lair somewhere (we’re looking at you [Jack]), odds are you may have seen the news that [Steve Jobs] stepped down as CEO of Apple this past Wednesday. This earth-shattering news even eclipsed that of the East Coast Megaquakeapocalypse. It sent the blogosphere into a tizzy, sparking a whirlwind of news posts and retrospectives on his career. It’s been impossible to ignore the coverage (we’ve tried), and since we see everyone else writing about it, we feel the need to be at least somewhat up on our current events as well. At the end of the day though, we don’t care how many patents [Steve] owns, how many failed products he has dreamed up over the years, or that he and [Woz] used to wear matching thongs to the beach in the 80s*. Nope, we just care about the hacks. 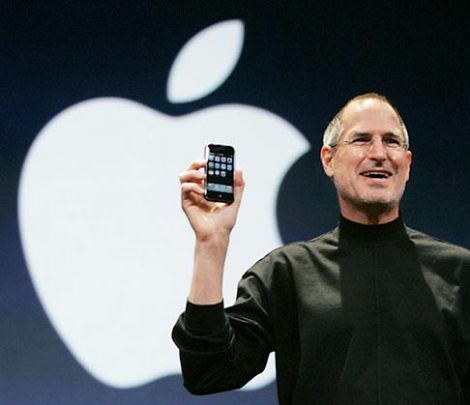 So here’s a trip down memory lane highlighting the Apple-related hacks we’ve seen so far in 2011, which will forever be known as the year [Steve Jobs] gave up the reigns at Apple (again). If you’ve got an ARM development board gathering dust in the corner of your shop, perhaps you could repurpose it as an oscilloscope. [Arend-Paul Spijkerman] was able to use an mbed and LPCXpresso as the hardware end of an oscilloscope. He didn’t use a standalone screen as a display, instead opting to push the scope readings from the hardware to a computer for display. This was greatly simplified by using StampDock as a basis for the GUI. His circuit diagrams calls for an RS-232 connection for the LPCXpresso but not for the mbed. We’re not quite familiar enough with the mbed to know why, but perhaps those in the know can clue us in by leaving a comment. The probe connections are quite simple, each made up of a voltage divider and a pair of diodes. But the breadboard above looks much busier because it has two oscilloscope circuits built on it, and there’s a 10 MHz clock and a 4040 ripple counter which were used to provide a test signal. 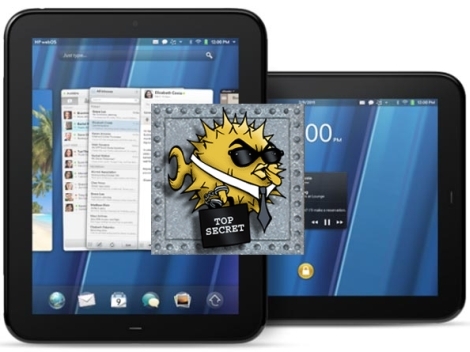 [Russ] was lucky enough to get his hands on a deeply discounted HP TouchPad, and after hearing about the huge bounty being offered for getting Android up and running on the device, he decided to poke around and see if he could make some headway. He started off by making a full backup copy of his file system using a tool HP has on their WebOS site, just in case anything unfortunate happened to his device in the process. He grabbed a copy of the ARM cross-compiler and set off to build a copy of OpenSSH for the TouchPad. Once he had the binaries in hand, he started what he thought would be the arduous process of getting SSH onto the TouchPad, but it turned out that it was a simple drag and drop operation. After remounting the file system to allow write operations, he fired up the SSH daemon and hoped for the best. It worked like a charm, and while it’s a relatively small part of getting Android running on the TouchPad, every bit helps. 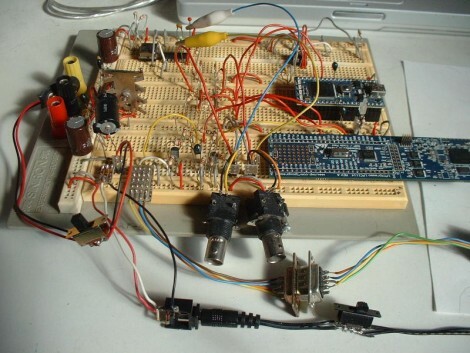 When it comes to learning about microcontrollers, everyone has to start somewhere. [Lady Ada] recently posted a tutorial on burning the Arduino bootloader to standalone chips for those just getting started with the micro. The tutorial cites a common situation, where someone is working on a project using an Arduino chip but they don’t want to sacrifice their dev board when just the micro and a few other components would do just fine. A short list of supplies is required, including an Arduino, a proto shield kit, a ZIF socket, and a blank ATmega chip. The process is probably pretty straightforward and likely familiar to many of you out there. The ZIF socket is soldered to the board and handful of wires are added for powering and programming the new chip. The protoboard is installed on top of the Arduino like any other shield, and using a sketch that [Lady Ada] has made available, the bootloader burning process is a cinch. It’s a useful tip for newcomers, and definitely a skill that seasoned Arduino users should have under their belts as well. [Ben Krasnow] is working on a project that uses an extremely expensive specialty mirror. He needed to cut curves into it, taking care not to chip or shatter the material. He’s found a reliable way of doing this with a CNC mill and is sharing his methods. The material he’s working with is a cold mirror; it reflects visible light while allowing infrared light to pass through. 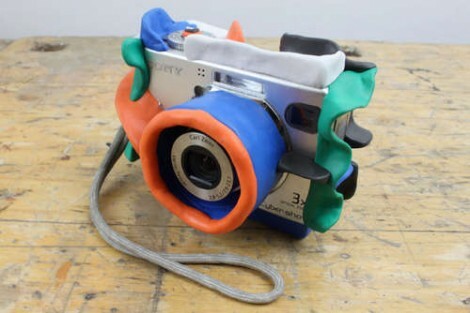 He had to custom order it, breakage is not acceptable. [Ben] explains that the biggest risk when milling glass is the clamping method used. He built his own jig and uses shims, rather than clamps, to secure the material along the X and Y axes. It is held down on the Z axis using a bar of acrylic spanning from one side to the other with rubber feet on the bottom. A diamond burr cutter does the work, spinning at 3000 RPM. [Ben] recommends moving the head at the slowest rate possible in order to give the cutter time to do its work. And of course the material needs to be kept cool by pumping cutting fluid across it. 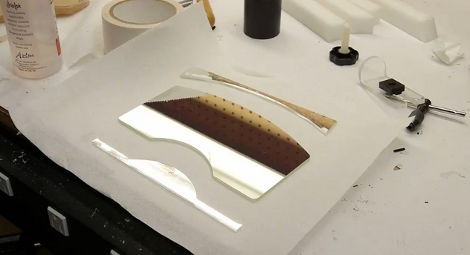 As he shows in the video after the break, what you get is a piece of glass that comes out with clean and smooth edges. In case we’ve sparked your curiosity, this mirror will be used during an MRI scan. The patient looks at a monitor reflected in the mirror at a 45 degree angle. At the same time, an infrared camera records the patient from the other side of the mirror to monitor where they are looking. There’s something calming about looking up into the night sky and seeing an array of shining stars off in the distance. [Marou] is a big fan of stargazing, but sometimes conditions are not optimal, so he decided to bring the stars inside. His idea was to build a ceiling lamp that didn’t bask the room with light, but rather one that reproduced the peaceful twinkle of the night sky. He covered a wooden table with dark fabric and drilled a ton of tiny holes into the surface. He fitted the holes in the table with two big bundles of optical fibers since one bundle couldn’t quite cover the entire thing. To light the cables, he built a pair of 4-LED illuminators, which contain red, blue, green, and white LEDs. Each light source is controlled via an Arduino which takes its direction from [Marou’s] infrared remote. While the idea isn’t new, the implementation is pretty cool. At first we were expecting a small lamp, but anchoring an entire table to the ceiling as a light panel is definitely something we hadn’t seen before. If you want to build something similar in your own living room, [Marou’s] Arduino code is free for the taking.